The HA Type 609 cabinet is manufactured in hot dipped galvanised mild steel and designed to MCX 0014 criteria. 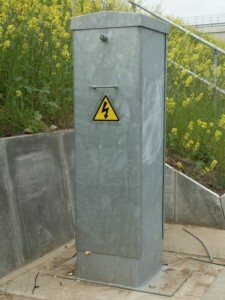 This meets the Highways Agency specification MCA 1188 for housing a range of power distribution and communication based equipment for their network. The internal equipment can be accessed by both front and rear removable doors which are secured using a single stainless steel double-dee screw fixing lock. All fixings are manufactured in stainless steel and are designed to be installed in geographical areas with a harsh environmental classification. 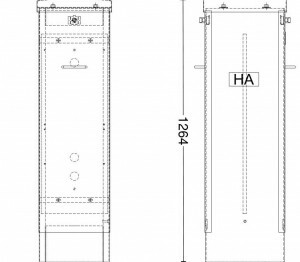 The cabinet design has been approved to TR1100 and passed all environmental and EMC tests in accordance with TR2130 which have been carried out by an independent accredited organisation which allow it to be used on Highways Agency and Local Authority managed roads. 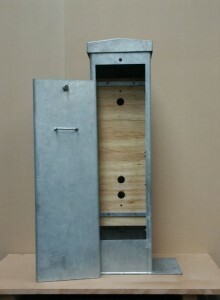 The standard roadside enclosure comes complete with locks and a marine plywood backboard. A pack of 4 holding down bolts, washers and nuts are supplied. Please note that the standard HA 609 cabinet does not come with a plinth frame, plinth skirt, security strap and keys which are normally required but are supplied separately.